The petrol-powered compact SUVs are still making their mark on the market. 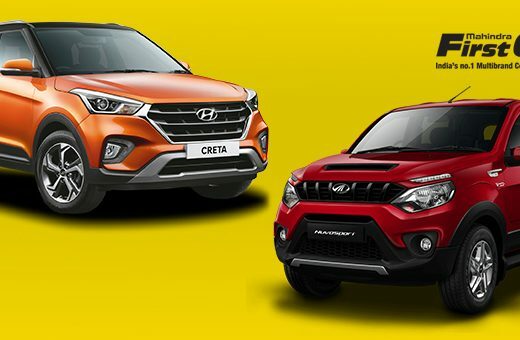 There are just two solid options in the market till now – the Ford EcoSport and the Tata Nexon. The Tata Nexon is a totally new car with a new design and is making Tata’s debut into this segment. The Ford, on the other hand, has updated the EcoSport quite well. The car has totally kickstarted the segment. Let us locate the differences between the two and pit them against each other. The EcoSport is a little biased towards the traditional designs of the SUVs, which can be said with the spare on the tailgate. The hexagonal grille puts further emphasis on the fact. This upright stance has benefitted Ford and they are not removing this. Tata has assorted to a coupe design on the other hand. But the squat design still gives it the rugged looks of the SUV. It gets the smiling grille of Tata along with the massive wheel arches. The body also has a good clearance. The contrasting roof and the ceramic finish around the fog lamps make it difficult to overlook the styling elements of the Nexon. The looks of a concept car could be what gives Nexon the edge. Neither of the SUVs disappoints considering the fact that the petrol engines need proper refinement. Despite the fact that there are 3 cylinders, the engines are free from vibrations. The Dragon unit of the Ford is actually a little better. Tata is new to the world of petrol and this becomes clear when it comes to drivability. Although the new 1.2-litre Revotron engine performs quite well and has good technologies for the inlet and exhaust, the power delivery is not quite linear. Lifting off the lower speeds would cause a noticeable jerk. The Dragon engine is very good. The performance is smooth and offers great power delivery. The engine does a really great job. The acceleration figures are also better for the EcoSport. Not only that, even in terms of efficiency, the EcoSport engine performs quite well. The Nexon offers a 6-speed gearbox and there is a 5-speed unit in the EcoSport. There are absolutely no complaints in these terms. Although the Fords have always favoured the drivers, Nexon outperforms the EcoSport. The ride quality is also very good and does not let you feel the bumps. Tata always cares about the comfort of the passengers and space allocation is quite good. The coupe routine is cleverly designed by dropping the rear window into the place where the rear quarter glass would be. The headroom is ample but not as much as that of the Ford EcoSport. However, the Nexon is wider and this does not change even with the EcoSport facelift. The front seat is not that comfortable for the Nexon. The quality of the materials is good in both. The EcoSport has become a really good machine with the facelift from Ford. The handling and ride are excellent along with the engine. The Nexon is defeated by a good margin. The Tata Nexon, on the other hand, has better space for the passengers and some added features and that too at a lower budget.